Take a swing for charity! - Perfect Pitch HRD Inc. Perfect Pitch HRD Inc. is a Not-For-Profit Corporation that raises money and awareness for mentally and physically handicapped children and young adults, as well as, sports programs for disadvantaged youth. 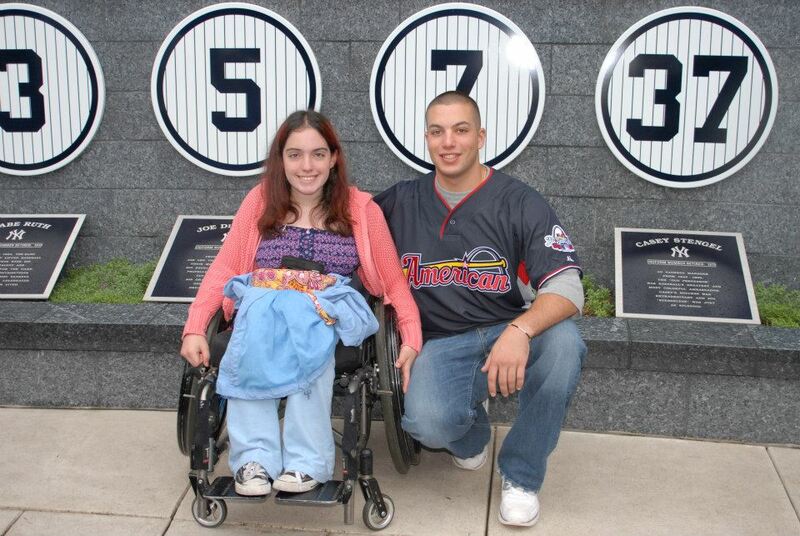 Michael Pesci with Rebecca at Yankee Stadium Monument Park. Learn more about Rebecca. Thank you to all of our competitors, volunteers, and sponsors who continue to support this worthy cause. With all of your support, Perfect Pitch HRD Inc. has been able to raise over $200,000 since its inception. Subscribe to our mailing list to receive updates from Perfect Pitch HRD Inc.
Stay informed about upcoming events and how we support our beneficiaries. Professional athletes and celebrities have donated their time and memorabilia in support of Perfect Pitch HRD Inc. Donate $50 or more to receive a free memorabilia gift. Proceeds from Perfect Pitch HRD, Inc. go directly to mentally and physically challenged children, special scout troop #364, and sports programs for disadvantaged children. Ellen Show - What makes you smile? Perfect Pitch HRD Inc. helps make our beneficiaries smile! Watch the highlights from Rebecca's ballet performance. Don Larsen, NY Yankees Pitcher '55 - '59, has been a long time supporter of Perfect Pitch HRD Inc.
Frede features UMBC baseball player Michael Pesci who has been a success on the field for the Retrievers while also making an impact through his charitable efforts with Perfect Pitch, the not-for-profit he founded as a youth. Perfect Pitch HRD Inc. helped celebrate Rebecca's Sweet 16 birthday.